When I finally sat down and did the math before my senior year of college, I realized that I had been wasting money on my meal plan nearly every week for three years. I don’t mean that the meals were overpriced for their quality, though they probably were, but that the meal plans were set up to take advantage of the limited options available to the students. 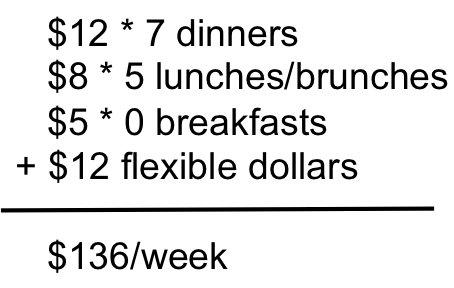 I discovered that the meal plan price was calculated by multiplying the cash price available to students at the dining hall door by seven dinners, up to seven lunches/brunches depending on the total number of meals on the plan, and then breakfasts for the remaining number, adding in the number of flexible dollars available each week, and then multiplying by the number of weeks in the semester. That means that each time a student failed to use all of her flexible dollars before they expired at the end of the week, which happened frequently, or ever used a meal for a lunch instead of a dinner or a breakfast instead of a lunch, money was wasted off of the cash price she could have paid to buy individual meals instead of being on the plan. Not only were the meal plan prices the same as the cash student rate (surprising in itself) but the meal plan assumed the student was always eating the most expensive meals! When I saw the math that bore out those conclusions, I decided to go off the meal plan for my senior year, which was an option for me because I lived in a suite with a kitchen. I simply loaded my ID card up with flexible dollars to use whenever I wanted to go to the dining hall and was confident that I wasn’t wasting money by choosing the wrong meals or being forced to by junk food at the campus store on Saturday night just because I had dollars expiring. The point of my story is that a little basic math can go a long way toward helping you choose a meal plan (or not) that is most cost-effective for your needs. If you live on-campus, you may be required to buy some kind of meal plan; if you live off-campus, you may or may not be able to buy a meal plan. You need to also factor in if you have access to a kitchen or any kind of food storage or preparation equipment in your room, suite, or dorm and what meal plan options that opens up for you. If you can’t even fix cereal for yourself and don’t care to change, you’re going to be dependent on your meal plan. Do you need to have a full meal three times per day, two times per day, or less? What food can you store and prepare in your room? Are you going to miss out on seeing your friends if you don’t eat in the dining hall? Will you need meals throughout the week or only on weekdays? Do you need all-you-can-eat options for your high metabolism or would you be better off paying for food a-la-carte? 3) Compare apples to apples. 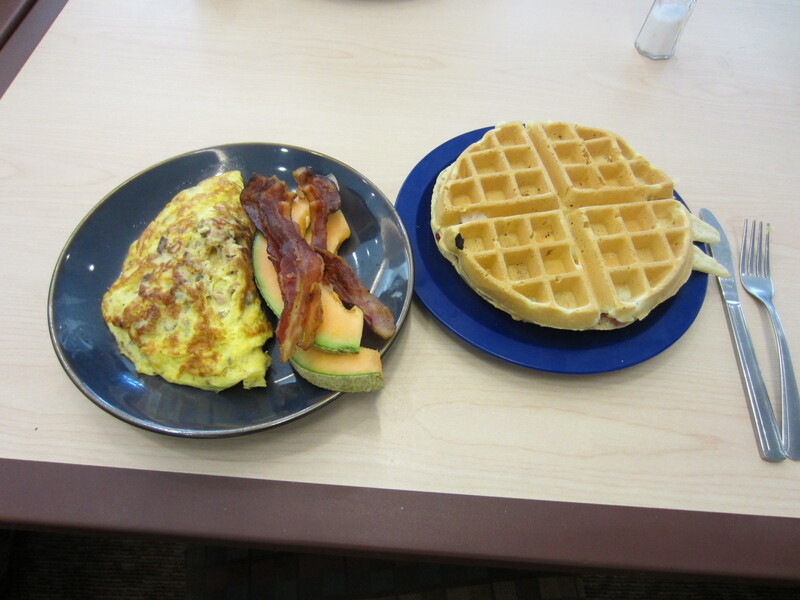 Most meals plans are a combination of dining hall meals (often all-you-can-eat) and flexible dollars to be spent at on-campus or local eateries. You must start by converting meals to dollars – not what you value them at, but what you can pay in cash to buy them individually. This way, you can compare across plans to determine what plan best meets your needs and the lowest price and also compare the plan with buying groceries or pre-prepared foods from competing sources. It probably hasn’t sounded like it from this post, but I actually really liked our college’s dining hall. I thought the food was good and they had lots of options. It was a great time to socialize with my friends and take a break from homework, which is why I continued eating there after I had access to a kitchen. And you can’t beat someone else cooking for and cleaning up after you! I can’t believe how much my parents were paying to feed me, though. The current price of the 12 meal plan at my college is $730/month. Together, Kyle and I spend $420/month currently, including eating out! I bet we could eat out twice a day and spend less than $1460/month. Have you priced out how your college determines the price of your meal plan? Have you you found a frugal alternative to eating in the dining halls? 20 Responses to "Double Check that Your Meal Plan Isn’t Screwing You"
I totally agree that college meal plans are unbelievable. Plus, I hated feeling guilty when I didn’t eat a meal there…because it was already paid for. It seems like a much better idea to pay as you go and eat some meals that you make at home. Unfortunately that wasn’t an option for most student at my school as they were required to buy a meal plan. How was it handled at your college? My college actually didn’t have this option. That was probably a blessing since it forced me to learn good cooking and shopping habits early on. If there was a meal plan available, I’m sure I would’ve taken the easy route and opted for that. Instead I made most of my own meals in the dorms. We’d even take turns making big group dinners for other people in the dorm to make things easier. I’m sure it would be much cheaper that way too. Hm, I’ve never run across a college without a meal plan option. The really good part about a meal plan (other than putting off the responsibility of learning to grocery shop and cook) is that you are freed from the time it takes to prepare and clean up meals so you have more time to study. When I lived in a suite with a kitchen we sometimes made group meals, which was very nice, and I think we would have done that all the time if not for some of us being on the meal plan. I definitely had way too much of a meal plan my first year in college. My second year, I cut it down a bit and after that, I stopped dorming. What you said is true – I wasted A LOT of money freshman year on that meal plan. The way the calculations worked out for my school, there was absolutely no incentive for buying beyond the minimum meal plan because you can just add dollars if you want more meals for exactly the same exchange rate. I wish I had known that all along – and been able to tell my friends! I was on a meal plan for the first two years of college and like you, once I did the math, I was shocked at what I was spending. My first year I had the smallest plan but it was a tad bit too small–I got a certain amount of meals per week (didn’t matter if I had 4 meals one day and 2 the next. It was tallied from Monday-Sunday so I just had to keep track) and certain amount of money for the semester that was to help keep me fed after the meals were gone. The only thing was the meals helped out M-F but not Saturday or Sunday, so I was spending a lot of flex money on those days. The next year, I got one with a smaller amount of flex money but more meals. It was alright but still not worth it. I had never before calculated the per-month price in the context of how much we need feed ourselves now on groceries and such. It’s really sickening! Was the conversion between flex and meals exactly what the meals were in the plan at your school, like mine? For the most part yes. There were a few areas on campus that gave an incentive to not using a “meal” purchase and just spending the flex money. Sadly those didn’t come around until midway into my second year but my third year I was living at an “apartment” on campus that had a kitchen and just purchased groceries. I spent a lot less if I remember correctly. One thing that I need to start doing with our meal planning is to factor in left-overs, and cook MORE food to provide lunches for the days that follow. Far too often, I leave myself to “wing it” for lunch, which is where the costs can escalate. We just have a few set foods we eat for lunch and they are hardly ever leftovers. I hate winging my packed lunch the morning of – it makes my breakfasts and dinners a lot less flexible. My school had a la carte pricing. It was nice, because it meant that I wasn’t getting charged the same price for a sandwich at lunch cart in the social sciences building as for a pizza in the late-night grill under the freshman dorms. I don’t remember the exact numbers, but I always chose the smallest plan and then would have to scramble to spend everything left over at the end of the year. You couldn’t split between meal card and cash so it was tough. My best year I left three cents. I was pretty happy with it. Of course, the campus convenience store had the items as cheap as a dollar, so I knew I would never forfeit more than that. A la carte food service can eat you alive as well! There was one semester when I was in college when I particularly noticed that, as I kept having to feed more money into my account. I think the best option is one that is allowed on most cafeteria plans and that is: some buffet / meal tickets plus some cash. I wasn’t required to eat my cash value on a week to week basis, and my daughter didn’t run into that either. Our cash value was available for any time during the semester. You may also find that freshmen are expected to purchase a higher meal ticket plan than upperclassmen. That’s not entirely bad. I wanted to know my freshman daughter always had two meals a day regardless of whatever else might happen. As a senior, she had a minimal meal plan so to eat with her friends but generally handled her own groceries as she had a full kitchen in her on campus apartment. Monroe on a Budget recently posted..Is it public record that you received financial assistance? In most cases, no. At least what an a-la-carte plan has going for it is that it’s similar to real money! The details you gave are different from my experience but certainly colleges and universities vary widely in their options and requirements. Thanks for your comment!